What is Photoshop 0-60 separations course? The 0-60 Photoshop course on separations is a clear, step-by-step process for you to learn the four main separation methods in Photoshop. This course includes a breakdown of Spot Colors, Index Colors, 4-Color Process, and Simulated Process separations. You will also learn how to estimate colors, set up separations in Photoshop as a digital proof so you can troubleshoot your separations before you even print a positive or burn a screen. 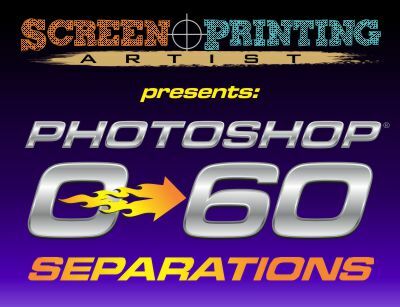 This course is the culmination of over 20 years of screen printing separation knowledge that has been distilled down into a manual system that you can use when you have to separate a bitmap image in Photoshop. This course started with in-person consultation training and the most common requests were for more breakdowns of the four main separation methods that could be broken down into STEP-BY-STEP processes that could be experienced and practiced at an individual student's pace. With this course the next level of interactive and paced out, STEP-BY-STEP training will be available to members with improved videos, practice artwork, and individual attention for questions and answers. Each class session will include a monitored and private Facebook group that will allow for discussion of tasks, jobs, and business questions that may be outside of the regular course training. The friends and associations that can be made from this private group can provide ongoing benefits to students long after they have completed the training. The first section covers the fundamental SETUP and SYSTEM that all of the separation methods use to create a working digital proof. The next area in Spot color covers the creation of a working UNDERBASE and also how to create some blending and shadows. The final Spot color section covers more detailed blending of colors and how to COMPENSATE for dot gain in blends and overlapping shades. The first index section covers the fundamentals of what is unique about INDEX splits in setup and processing images. The second section in Index separations covers a more detailed image and UNDERBASE setup as well as color selection and optimization. The third area explores some advanced Index separation techniques with some EXPANDED separation styles that get more out of every color. The primary section goes into details on how color PROOFING and ADJUSTMENT are done to images that are to be separated for process color. The second area discusses how to deal with an image that has too much out-of GAMUT colors and how to COMPENSATE for this common issue. The final section covers EXPANDED GAMUT 4-color process (which is more than 4 colors) and how this can MANAGE the dot gain issue for certain images and long print runs. The first section will cover how to SET UP all simulated separation sets, no matter how complex, so that you can work your way through them. The next section will detail the different ways that UNDERBASE are created and how top colors are SELECTED and separated into screens. The third area will cover some advanced simulated process separations for DARK SHIRTS with shadows, transparent areas, and lots of color blending. Additional areas will be included that will cover FLESH TONE separation and other COLOR crunching concepts to save colors on press. The final bonus section will cover COMBINATION separation where Index seps and other methods (unique halftones, shapes, etc) of creating values are integrated. There will be four main separation divisions covering the top ways of separating in Photoshop (Spot color, Index color, 4-Color process, and Simulated Process). Each type of separation will be broken down to show the SYSTEM that will make that process consistent and how to modify/prep artwork for each style. The practice files are included so students can follow along and separate the files using each method. The course shows STEP-BY-STEP processes on how to separate images for each type of separation style and EXPLAINS why you should use each different style of separation on different types of artwork and/or for screen printers with different capabilities. What happens after the Photoshop course ends? Each student will graduate the course with their permanent access to all video lessons, practice files, and on-going access to the private Facebook group. Every student will also have a premium seat for any new course or content. This Photoshop course is the result of over 20 years of industry work using Photoshop to separate screenprinted designs for apparel. The how-to information in this class are more than 4 industry seminars. Despite this, I wanted this class to be affordable so smaller shops could use Photoshop to create manual separations without a plug-in and without spending a lot. This course is priced at a cost that is lower than any industry training out there and it is packed with specifically what you need to know to separate in Photoshop. The fee for lifetime access is only $247 and if you use the code: ARTIST25 you can save another $25 during checkout. Fantastic training course! I have learned more in the first video than in the last two classes I did at last year's show. Thanks a lot! I finally feel like I can handle images in Photoshop for my company. Appreciate the knowledge. Thanks for taking extra time so I could understand each area. I learn a little slower but with it broken down I got it to work!